Imagine yourself at the kitchen table, enjoying a cup of coffee, reading the newspaper and listening to the birds chirp outside. Your husband is sitting across from you, staring off into space, and ignoring the scrambled eggs which are getting cold on his plate. Suddenly, he turns to you, and by the intense look in his eyes you know that he's about to say something important and full of passion. "Let's sail around the world!" is probably the last words you would have expected to hear come out of his mouth. But they did, he said them, and by the way he's acting and the seriousness of his face and voice, you know he means it. Now what do you do? Whether this scenario is realistic or not, it is usually the husband or boyfriend who has the itching desire to sell everything, buy a boat, and sail around the world. And its usually the wife or girlfriend who finds herself trying to cope with the prospect of leaving everything behind and going with him. Some women embrace the idea as immediately and passionately as their mates, yet others cringe at the thought. Debra Ann Cantrell has taken the question of whether or not to go cruising, one which she herself faced 10 years ago, and turned it into a self-help book of sorts, designed to help address women's fears and concerns in a realistic, straightforward way. There are many things to consider when you faced with the prospect of going cruising: fears about the sea, traveling to foreign places, concerns about being away from family and personal property, schooling children, paying the bills and even how to keep in touch with loved ones. Cantrell not only went through the same ordeal herself, when her partner, Jim, decided he wanted to live on a boat and cruise around the world, but also conducted a five year study of women who faced the same situation. 107 women answered her ad in Cruising World and other publications and described for her in detail what aspects of the cruising life affected their lives. As Cantrell herself explains, "Learning about the experiences of other women helped me to make a change and thrive in a new lifestyle. My journey was reinforced by the discovery that I was not alone." Cantrell's book addresses the concerns and fears in a realistic, logistical fashion, interspersed with anecdotes and cases of the women in her study. There are whole, indepth chapters on fear and how to manage it, interpersonal dynamics of the cruising couple, leaving life on land, and what benefits the cruising lifestyle might hold. Changing Course is a good overview of the realities of cruising with a mate, especially the chapter about the cruising couple, because many times the success of the voyage hinges solely on whether or not the couple can work as a team. You so often hear stories about married couples going cruising and splitting up halfway through the trip, yet few women analyze their relationships beforehand to determine whether its strong enough to survive life on a boat. Changing Course helps put issues in perspective and gives women an invaluable tool to help make this life changing decision. Another positive aspect of this book is its use of personal narratives by the women in her study. They not only make the book more interesting to read, but they also give the reader something to identify with. If you are a guy who has expressed a desire to go cruising, this is a great book to give your girlfriend or wife. If you are going to drop a bomb on her like that, wouldn't you also want to give her some tools to help her cope and agree to go with you? This book will give her the facts from an objective point of view and puts boating and cruising in a positive and realistic light. Cantrell quotes Grace Hansen in her book as saying, "Don't be afraid you life will end, be afraid that it will never begin." So often when faced with change we try to avoid it, ignore it and hope that it will go away. 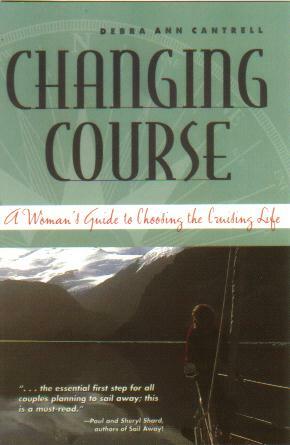 In her book, Cantrell encourages the reader to embrace change as an opportunity and not view it as a problem or fear it. Perhaps the cruising life is not for you, after all, it isn't for everybody. Cantrell's book aims to help women analyze all aspects of the cruising life in order to make the best decision about cruising. Yet as her study shows, "80 percent of the women whose partners proposed the cruising life were initially resistant to the idea of living on a boat; of these, 100 percent reported experiencing and "enormous" increase in their overall happiness and life satisfaction because of the change they eventually made." These statistics, coupled with the fact that 78 percent of the women had little or no sailing experience, speaks a lot for the cruising lifestyle, or enough to at least consider it. The odds are you will love it too.